PM Netanyahu, Lithuanian foreign minister, speak about expanding cooperation in all areas, especially security. 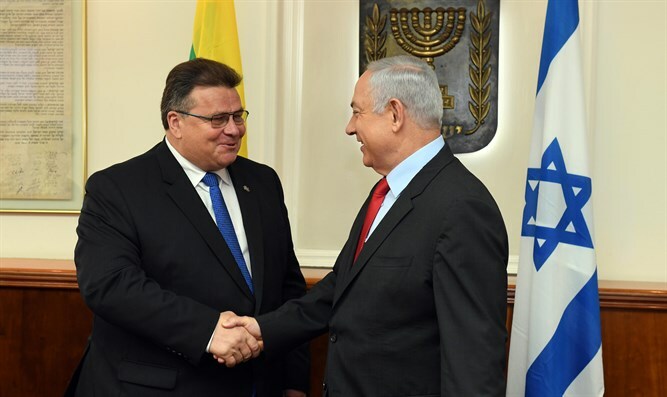 Israeli Prime Minister Binyamin Netanyahu on Monday met with Lithuanian Foreign Minister Linas Antanas Linkevičius. In addition to his position as Prime Minister, Netanyahu also serves as Israel's Foreign Minister at present. "Israel and Lithuania have had a relationship for many years," Netanyahu said. "We welcome you, my friend, and we welcome your entourage. I hope we will be able to discuss the ways in which we can strengthen our friendship." Responding to Netanyahu, Linkevičius said, "We regularly schedule trips for officials of all ranks. Our President visited recently, and you have warm regards from my government. All of these meetings show that we are expanding our partnership in every area." "My entourage is varied, and includes businesspeople, community leaders, security personnel, and others. Our security cooperation is expanding. As you said, we have a long history of cooperation connecting our countries." Linkevičius gave Netanyahu a small statue of a girl, in honor of the Jewish community in Šeduva, Lithuania, which was completely destroyed. Lithuanians began murdering Jews shortly before the Nazis arrived in the country, starting with Kovno, accusing them of preferring the hated Russian Communist regime, while the Germans would liberate them from its control. They cooperated with the round up of Jews during the war.